A motorist who ploughed into a group of men on Christmas Eve has been sentenced to youth detention. 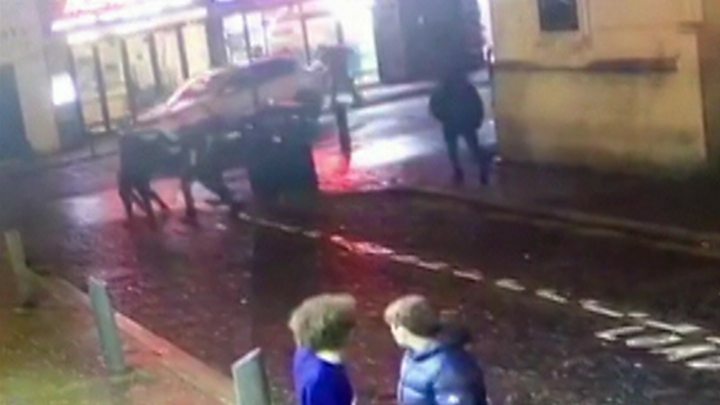 Callum Rose, 19, drove the Ford Kuga into the four men as they walked through the centre of Liverpool in the early hours of 24 December. He admitted causing serious injury by dangerous driving and breaching a suspended sentence. Rose, of Munster Street, was sentenced to four years and six months in custody at Liverpool Crown Court. Two men, both aged 19, were injured when Rose hit them on Slater Street at 02:45 GMT. The stolen car was recovered on Aigburth Road shortly afterwards and Rose was later identified as the driver. He also pleaded guilty to aggravated vehicle taking, dangerous driving and driving without a licence or insurance. Rose was banned from driving for seven years and one month. Det Insp Paul Speight of Merseyside Police said it was a "particularly horrific" incident captured on CCTV. "The fact that he left the scene when it was obvious that someone was seriously injured shows his complete lack of empathy and regard for the safety of others." Police said both victims were making a recovery.